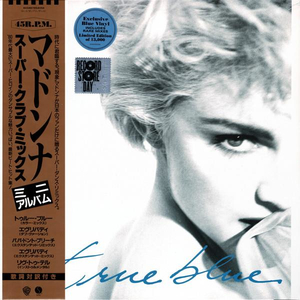 Replica of Japanese pressing of Madonna's "True Blue Super Club Mix" , with obi strip. On Blue Colour Vinyl. Limited to 13,000 copies worldwide. Tracklisting: A1 True Blue (The Color Mix), A2 Everybody (Dub Version), B1 Papa Don't Preach (Extended Remix), B2 Everybody (Extended Version), B3 Live To Tell (Instrumental)Replica of Japanese pressing of Madonna's "True Blue Super Club Mix" , with obi strip. On Blue Colour Vinyl. Limited to 13,000 copies worldwide.